In this Professional world it is very important to have good communication and Presentation Skills. What Matters more is How your Communicate. There are certain Ways which help us to improve one’s way to Present . 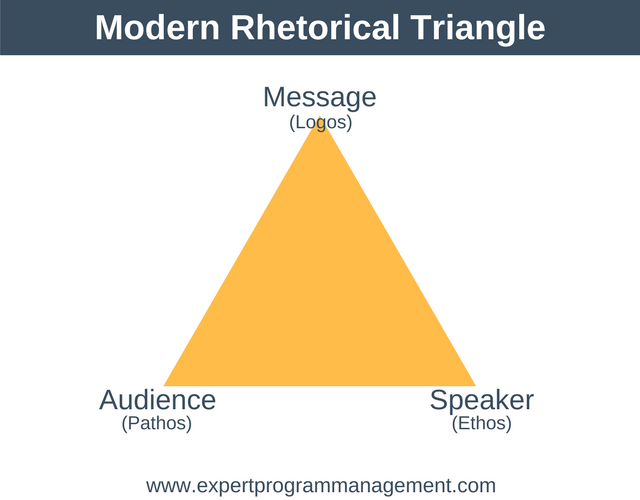 Rhetoric Triangle is one of the tested and effective . Thus, the Rhetorical Triangle is a tool that helps you formulate your thoughts so you can clearly present your position in a persuasive way. It can be used for both written and verbal communication but is particularly applicable to written communication. Logos is the main body of your argument and is designed to appeal to reason. Using an appeal to logos you attempt to use facts, truths, and logic to appeal to the reason of your audience. To be effective a persuasive speech must do three things. First, it must identify you as trustworthy in your audience’s mind (ethos / speaker). Second, it must connect emotionally with the audience to move them to action (pathos / audience). Third, it must contain a logical and reasoned proposal or argument (logos / message). By following the six steps above you can dramatically improve the chances of your next speech or writing assignment being both more persuasive and having a greater dramatic impact on your audience.